I actually was never able to come across a link for this back when the vinyl came out last year (cassette was released in '09), and had completely forgot about it until a friend asked for some help tracking it down today (thanks for the reminder Davedge). 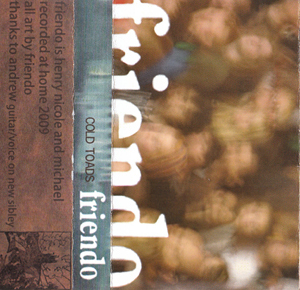 Friendo is the side project of Mike Wallace of your favorite Canadian band Women, and honestly much of this record sounds just like them, although not quite as bleak or as.....good. Overall relistenability will probably be pretty low for me, but there's some really great moments on the record, with "Callers" being my personal highlight, and I can only imagine this band getting better with time. thank you very much for this! great!